The Giulietta will be the first Fiat group car to use the company's Compact platform, which will also underpin new Chrysler, Jeep and Dodge models. TURIN -- Alfa Romeo will unveil its new Giulietta hatchback at the Geneva auto show in March. Alfa hopes the Giulietta will give the struggling brand a new impetus in the lower-medium segment, one of Europe's most important segments, which is led by the Volkswagen Golf. 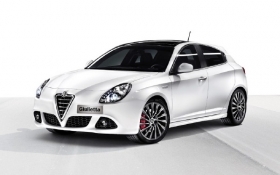 The Giulietta will go in sale in Europe in the spring, replacing the aging 147, which launched in 2000. The Giulietta will be the first Fiat group car to use the company's new C-Evo platform, recently renamed Compact. The Compact platform will also be used in North America for new Chrysler, Jeep and Dodge vehicles due to launch in 2012-2013. The next Fiat group car to get the platform will be the Bravo replacement after 2013. Fiat currently has no plans to export the Giulietta to the U.S.
Fiat will build the car in its plant in Cassino, central Italy, alongside the Fiat Bravo and Croma, and the Lancia Delta. Unlike the 147, which is offered as three- or five-door model, the Giulietta will only be sold as a five-door. Three-door cars are becoming less popular in the lower-medium segment, according to automotive analysts. The Giulietta will be sold with a choice of five engines, including three gasoline and two diesel versions, all fitted with turbocharging and a stop-start fuel-saving system. The Giulietta will be the third Alfa car of that name. Alfa produced the first-generation Giulietta as a sedan and coupe between 1954 and 1965. The second generation, a sedan only, was built between 1977 and 1985. Fiat is scaling back Alfa production as the brand's sales decline during the economic crisis. In the first 10 months, Fiat built 92,642 Alfa cars compared with 98,829 the year before, according to J.D. Power Automotive Forecasting. Fiat built 12,542 units of the 147 through October compared with 29,850 the previous year. Fiat has not announced yet sales target for the Giulietta. The 147 hatchback got off a good start after its launch in 2000 with more than 100,000 units sold from 2001 to 2003, but sales have slowed as the model got older.